With the air hose in the end ofthe duct and the cord free to run out, you will be able to blow the cloth through to the next opening, even on a long run of duct. Cleaning ducts is accomplished by rodding. Quick-coupling duct rods (about 1 feet long and 1 inch in diameter) are connected together with a wire brush or other duct rod leader at the head to facilitate cleaning. The rods may be pushed through manually or by means of power equipment. A 12-gauge galvanized steel wire attached to the leader is left in the duct for the cable pulling crew. Moisture inside a cable causes deterioration of the insulation; therefore. precautionary measures should be taken to avoid the accumulation of moisture inside the cables. Before pulling a cable. ensure that the cable ends are sealed against moisture invasion. 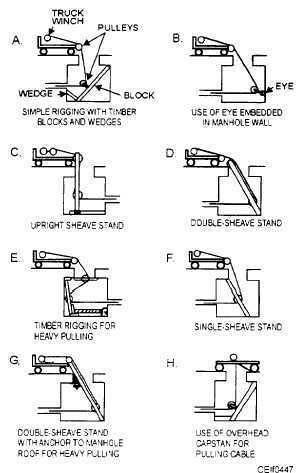 Figure 4-47 shows a number of ways to rig manholes for cable pulling. 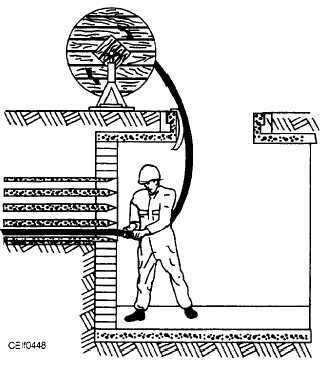 View A shows the cable pulley attached to a timber block which, in turn, is supported by a wedge. In view B, the pulley is shown attached to the manhole wall by means of an embedded eye. If you use this method. make sure that the lower sheave is in line and level with the duct in which the cable is to be pulled. To prevent injury, to the cable by sharp edges. line the duct mouth with a shield. Either of the above methods will probably be satisfactory for most of the jobs you will handle. Sometimes. however. more complex rigging is called for, especially in cases when the cable requires heavy pulling. For jobs of this nature, you will find the other views in figure 4-47 helpful. When pulling cables into a long duct. use a feeding tube or bell for applying a lubricant at the duct mouth. Make sure you use the lubricant specified by the manufacturer of the cable. Figure 4-47. - Manhole rigging for pulling cables. Figure 4-48. - Reel in proper position.